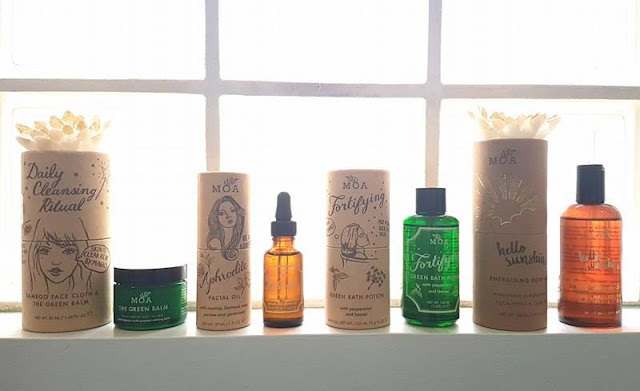 MOA, or the Magic Organic Apothecary, is a London based skincare company that believes in using herbal folklore to create products for the modern user. They have a wonderful range, all focused on using natural ingredients to boost wellbeing, improve skin radiance, and teach daily skincare routines. Our hero herb yarrow (Achillea Millefolium), is shrouded by tales of folklore and can be found beside hedgerows all across the UK. The miraculous powers of this humble herb have been used for centuries to heal and repair. Named after Greek hero Achilles, who legend has it, used it to heal his soldiers’ wounds after battle. MOA products continue this age-old tradition of using yarrow as a healing herb in all our products, which soothe, cleanse, moisturise, tone and energise. The therapeutic scents, herbal extracts and botanical oils used in the range, have a nurturing effect on mind, body and spirit. While I can't speak on the history of this herb, I can say I agree about it having 'miraculous' powers -- I have never used a bath oil so relaxing and invigorating, nor a beauty balm that heals cracked skin or broken skin overnight (especially around my finger nails -- bad habit of picking at my skin!). So let's have a look at each of these wonder products! 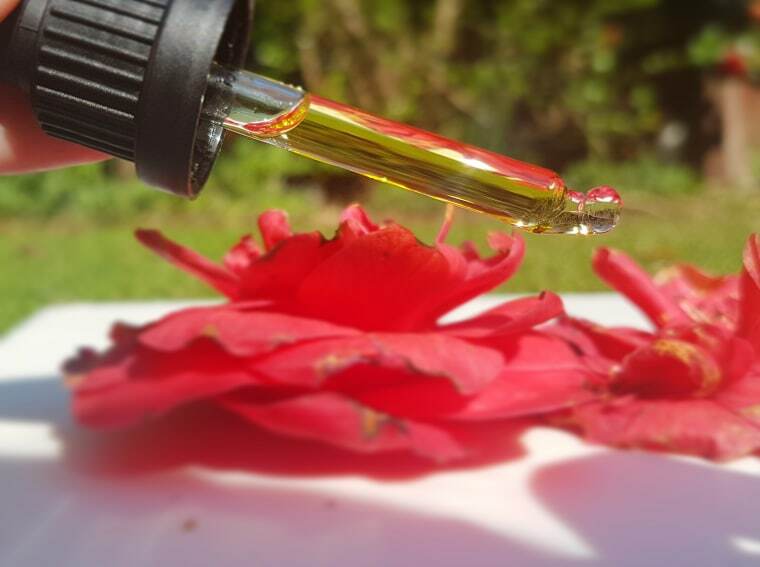 On first smell you are hit with a really unique blend of marshmallow and rose, making this facial oil one that benefits not only your skin, but your whole day. The slightly sweet scent lasts for several hours, even after the oil itself has sunk in. Packed full of nourishing and calming ingredients, this product is meant to help smooth fine lines, combat early aging, regenerate the skin, help with blemishes and redness, help fight dryness, and even skin tone. All that in just a few drops! The applicator is simple to use and easy to control, so you are not left with too little or too much oil on your face. All you have to do is use the dropper to apply to your face and neck after cleansing, then gently rub the oil in. I find just two drops is enough, so the 30ml bottle lasts ages. Plus, the oil is light enough to substitute a daytime moisturizer, but effective enough to be used overnight. For £22.00, you can't really go wrong with this item! The MOA facial oil, like all of their products, is made in the UK and is free from all parabens, SLS, phthalates, chemical ingredients, fillers, mineral oils, and petroleum. Aphrodite is also vegan. You can pick yours up from Love Lula, or direct from MOA's website. I can't big this bath oil up enough -- seriously, if you aren't sold on bath oils, this is the one that can change your mind. The 'potion' is a mixture of peppermint, fennel, yarrow, sweet birch, fir needle, and chlorophyll (yes, that stuff that is in leaves! ), and has an incredibly light, relaxing scent that is neither overpowering nor underwhelming. MOA has somehow achieved the perfect balance that makes for an instant mood lift. The first product by MOA I discovered was actually this bath potion, and I was instantly sold. I got a sample vial in my very first You Beauty box (RIP), and bought the full 100ml size while I was still in the bath. This is probably why they have won four awards. 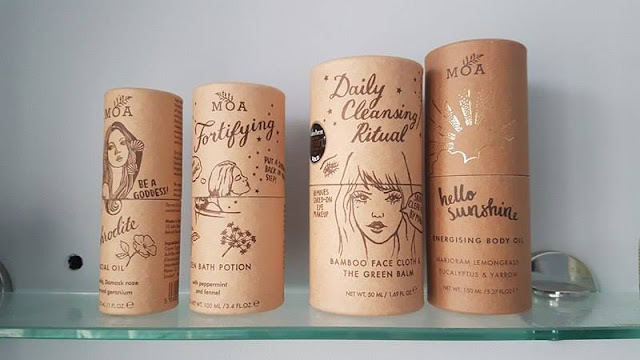 Overall, the MOA Fortifying Green Bath Potion gets five out of five stars from me, and when my current one runs out, I will without a doubt be moving on to my fourth bottle!The MOA bath potion is made in the UK, free from all parabens, SLS, phthalates, chemical ingredients, fillers, mineral oils, and petroleum, and is suitable for vegans. You can pick yours up for £27.50 from Love Lula, or direct from MOA's website. Ingredients: Helianthus Annuus (sunflower) Seed Oil, Mentha Piperita (peppermint) Oil, Foeniculum Vulgare (fennel) Oil, Laureth-3, Simmondsia Chinensis (jojoba) Seed Oil, Achillea Millefolium (yarrow) Extract, Abies Sibirica (fir needle) Oil, Betula Lenta Bark (sweet birch) Oil, Tocopherol, CI 75810 (chlorophyll). The Green Balm is actually the second MOA product I picked up. I think I got this out of a beauty box as well, but it was so long ago I can't actually remember which one it could have been. My first impressions were not very good to be perfectly honest, as my sample seemed to have congealed in a not so pleasant way. Months later however, I ended up grabbing the Daily Cleansing Ritual set on sale, which includes a full size (50ml) tub of the balm and a bamboo face cloth. Boy am I happy I made the purchase. Before I get into the uses for this balm, I will just run through the basics. The Green Balm was MOA's initial product, and it is the one that seems to be promoted most often. It has a thick consistency and texture, and until it warms up there is a very slight graininess to the oils. Once melted, the balm absorbs quickly and doesn't leave a sticky or greasy residue like many of the other balms I have tried. There isn't much smell to the product, but to honest, I think I prefer multi-use items like this to be fragrance free or have very faint scents. Unlike most beauty balms, this one isn't advertised just as a cleansing alternative or a 'cream' for eczema and dry skin. According to MOA, the balm can be used in nearly twenty different ways, including healing cuts and scrapes, fixing chapped lips, sorting out cold sores, soothing sore throats, fading scars or stretch marks, and calming burns. While I haven't used this balm in each of these ways to test them out, I have used it on dry skin, as an eye makeup remover, as a lip balm, and to quickly heal cuts. It works. 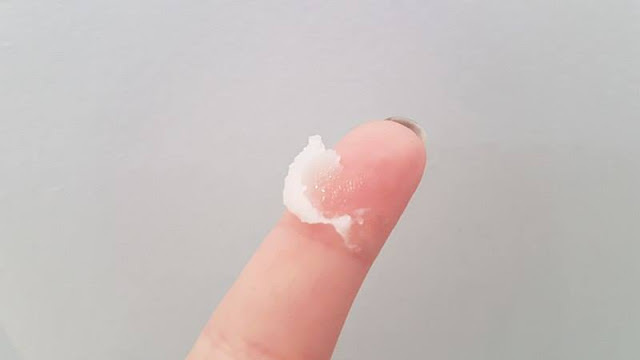 I have a terrible habit at picking at the skin around the sides of my fingers, and a day or two after rubbing this in, the skin will have almost fully closed over. I have replaced my previous eye makeup remover as I found it was nowhere near as effective as the Green Balm, although warning -- you will have raccoon eyes immediately after wiping off your mascara/eyeliner! For once, the claim that this is a 'multi-use' product is true, and more than that, it works perfectly for everything I have tried so far. The Green Balm is suitable for vegetarians, and can be used on both sensitive dry skin and oily acne prone skin. Even better, this product is 100% natural, 100% organic, and free from all those synthetic nasties. Want to try this out for yourself? 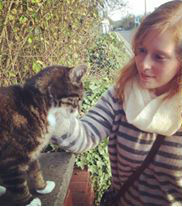 Grab one from Love Lula or direct from the MOA website from as little as £6. Cocos Nucifera (Coconut) Oil, Glycine Soja (Soy Bean) Oil, Prunus Amygdalus Dulcis (Sweet Almond) Oil, Cera Alba (Beeswax), Helianthus Annuus (Sunflower) Seed Oil, Achillea Millefolium (Yarrow) Extract, Melaleuca Alternifolia (Tea Tree) Oil, Chlorophyll, Limonene*. *occurs naturally in tea tree oil. *certified organic **occurs naturally in tea tree oil. Packed full of active ingredients, this energizing body oil makes a lot of claims (and deservedly so!) -- from the antibacterial lemongrass and marjoram to the muscle soothing eucalyptus and yarrow, each ingredient serves a purpose without forsaking safety. While I have not used this product as often as the other three, it is not for any bad reason -- I just have an overabundance of body oils to make my way through! What I can say from the times I have used MOA's Hello Sunshine is that it is a light, refreshing oil that absorbs surprisingly quickly for its semi-thick consistency. There is no greasy residue left on your skin, which for me is essential for a body oil. A lot of the ones I have used in the past left me with some random spots, especially when I used it on my back or upper arms. If anything, Hello Sunshine helped combat pesky problems. Plus, the smell is amazing! It is really citrusy, but not in the usual sense -- it has a bit of an earthy zest to it as well. I love using it in the morning before or after I shower, as then I can look forward to smelling extra nice the rest of the day. MOA suggests this can be used as a massage oil, and since it isn't too gloopy I can totally believe it would work great, especially on shoulders or the back of the neck. Actually, now I know what my partner will be doing later this evening! Need a hydration boost, an uplifting scent, or an excuse for a massage? Grab a 150ml bottle of this vegan-friendly no nasties body oil from Love Lula or from MOA themselves for just £22.50. Okay, so I have not managed to get the full size of these bath salts yet, but I was lucky enough to have a friend send me a little packet with just enough for a single bath. Normally I am not too keen on testing a single use sample, as I find it isn't enough to get a fair representation of the product, but for these bath salts, one use was all I needed to be won over. While it has a completely different scent from the bath potion, the mix of lavender, cardamom, pine, Himalayan pink salt, and sea salt makes for a perfect fusion of calming herbs and sharper spice. It truly is a 'dreamy' soak. I found the salts dissolved nicely, unlike some of the ones I have tried in the past that just seemed to drift around for ages. My muscles were able to unwind, and even my skin was getting a treat from the brightening lemon peel oil. Overall, I was really pleased with MOA's new launch, and I cannot wait to get my hands on the full size product. I can see myself introducing this into my weekly ritual, and I think I finally understand the draw of bath salts. You can buy your own bag of this gentle cleansing, therapeutic product over at Love Lula or from MOA direct for £25.00. And as always, it is free from all those nasties like SLS, petrochemicals, and artificial preservatives, plus is cruelty free and suitable for vegans! And that is it for my MOA spotlight! If you would like to have a little bonus post either about the bamboo cleansing cloth, or about me testing more of the suggested uses, let me know down in the comments. Until then, keep greening it up! I love MOA! Thanks for sharing your thoughts on these products, can't wait to try some! Would love to hear what you think when you try some more! Thank you for such a detailed review! I am loving the Green Balm so far and I look forward to trying out the rest of the range!